The newly announced designs of brownstone homes and live/work spaces will be in Madison Tower II. Equipment has been moved on site including two drilling rigs including four more for the site work period. To process about 4,000 cubic yards of dirt per day a rock crusher will be moved to the site. Between March 28 and June 13 drilling and blasting will be scheduled. To excavate caliche and dirt to 30 feet at Sullivan Square there will be 15 different blasts for prep work of underground parking and foundations. The Las Vegas development will have about 1,300 units. The Las Vegas mixed-use real estate will consist of Chicago style townhomes and Las Vegas lofts, high rise condominiums, live/work spaces, terraced condos, traditional brownstones and Las Vegas high rise condos at Sullivan Square. 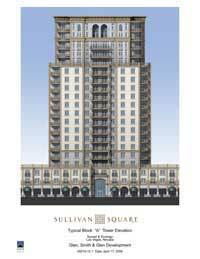 Call 702-505-6988 for a Sullivan Square Broker’s Alliance REALTOR to purchase a Las Vegas condo. Sullivan Square Las Vegas real estate preps for work site underground work.